You Review Things: Two Yumemiru Adolescence Singles! Our pal dofphoto wrote a pretty nice review for Party Rockets GT’s Time of your life, and said: Maniac, nobody gets into lesser-appreciated idols like I do, I can definitely do more review things; to which I replied, knock yourself out. So here’s dofphoto with another review! Yumeado is in my top five groups, but I won’t let that effect my feelings here. Let’s start by talking about the single-as-a-single trend Sony has been pushing on Yumeado. This would be the third single in a row that was released with one track — what is the purpose here? Historically, different “type” singles are released with a single girl per cover so fans can purchase their favorite idol, but these are grouped shots. EP/singles runs Y1000, these were released at Y450, so there isn’t a cash grab going on here. To add, these singles are limited to 20,000 copies and, for the first time that I am aware, failed to chart at Oricon. Yumeado is definitely going through some back end issues with the departure of Rei and sudden disappearance of Akari. My guess is Sony is trying anything possible to keep fan interest by being random/shocking (most of us are here for Yuumi anyways). I guess we will see how this plays out. I did some research on Mr. Green Apple to see who was responsible for this little ditty (curiosity), but I feel, in idol, who writes a song isn’t as important as how it’s presented by the group. This track feels like classic Yumeado in the vein of “Candy Chan.” Very upbeat and cutesy, it helps frame the youth of Yumeados’ vocals, Karin and Yuumi in particular. The mix is solid, with no overbearing keyboards, and percussion is kept at a playful pace as well. 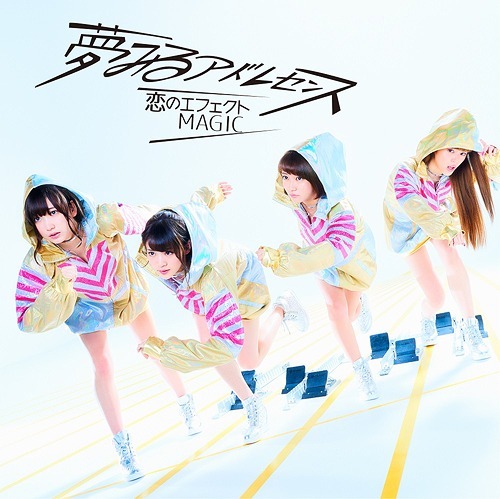 Yumeado for me is all about that hook and chorus, and “Effect MAGIC” delivers at every turn. I have no issues with this track in the slightest — my one gripe is that they released a MV for it so soon that now I have a theme in my head when I hear the track and that theme does nothing for the song. Once again, Yumeado hits all the right notes with the hooks and chorus (love the chorus). “Idol Race” is a perfect track for Yumeado and fits nicely into their body of work. I have been burden with the thoughts of the last few uninteresting singles (“Love for you” and “Fantastic Parade” were okay, I guess) so I am very happy with the latest tracks. Whatever is going on in the Yumeado camp, I hope it doesn’t end in disaster like a lot of groups we are seeing lately, and although I can’t imagine anyone else as a part of this group, I do hope they recruit experienced idols to replace Rei and Akari (if it comes to that). Never let it be said that Homicidols.com is not an equal opportunity celebrator of pertinent idol things. This is, after all, a music website with particular favor for the hard side of idol. Yes, that usually means particular groups and solo performers within certain milieus; sometimes, though, it means otherwise “normal” idols rushing headlong into the world of distorted guitars and double kick pedals.